It was only a matter of time before the search for the best food in college towns would land in my home state of North Carolina. Well that time is here. For those of you who do not know, Chapel Hill, NC, is home to the University of North Carolina Tar Heels. I have visited UNC a few times in my life. Usually for football games ( my dad is an alum and my parents met while in law school there) and to compete in swim meets. I could tell it was a unique town, but never really got to see what the food was like. In bringing you where to eat in Chapel Hill, I only thought it made since to start with breakfast. Multiple sources told me that I had to check out Sunrise Biscuit Kitchen. Biscuits in the south, ok I am sold. I really did not know what to expect upon arriving at Sunrise. I knew that it was on Franklin St, the street in Chapel Hill to find food, bars and shops, (Very similar to State Street or Pearl Street) and that is about it. 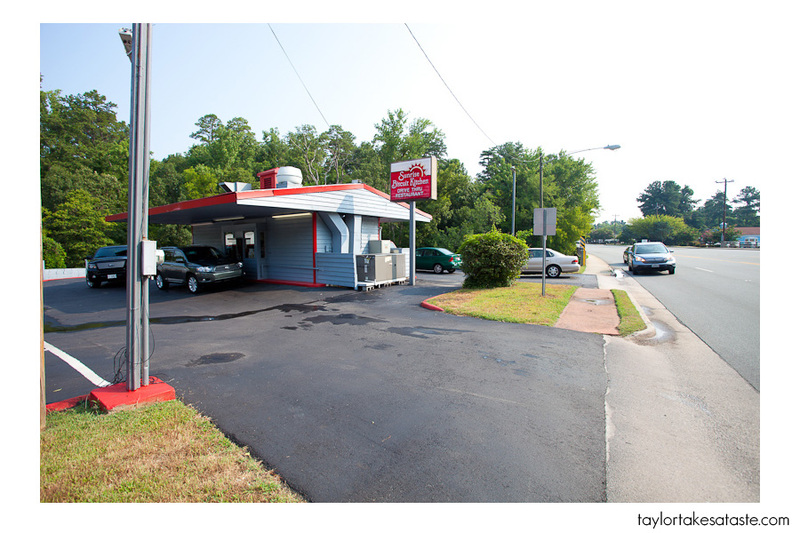 It is a little ways from campus, so you would need to drive there if visiting the Chapel Hill Campus. This is taken from outside the car, no desire to meet the Chapel Hill Police on this trip, but you get the idea of what it looked like upon driving up. Two things should catch your attention. 1. It is a tiny building and drive through only. 2. The drive through line has extended into the street. After waiting for a few minutes (long line but moved very quickly) I arrived at the menu. There are plenty of biscuits to choose from, and according to my friend Tim , “everything is good”. Tim grew up in Chapel Hill, so I would consider him a Sunrise expert. Here is what I decided to go with. A bacon egg and cheese biscuit. Mmmm The imperfections in this are what make it so perfect. Think about it. The egg hangs over the biscuit.The bacon is in pieces. The biscuit is not in a perfect die cut shape. These are all signs that it was made by people that morning. People are not perfect, home made food is not perfect. There is not a machine pumping out frozen pieces to be re-heated later. This was made on site by the people you see at the window. 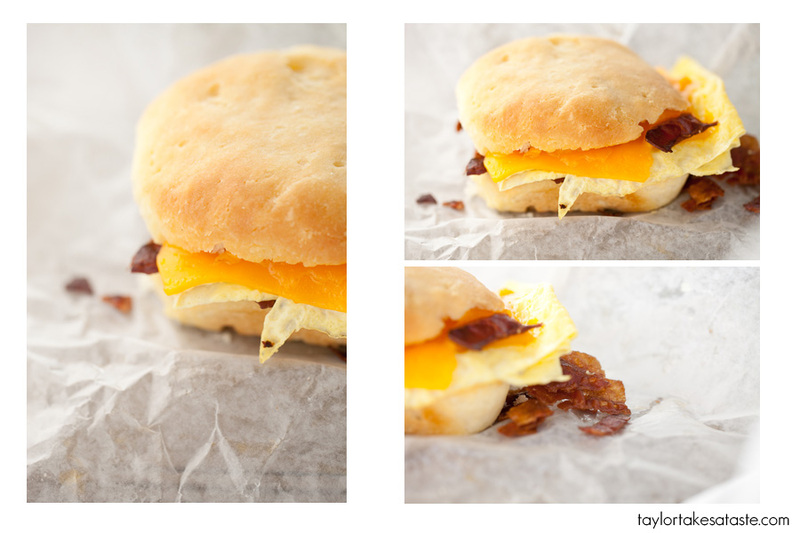 A warm buttery biscuit with cheddar cheese, fresh egg, and crispy bacon. I really can not think of a better way to start my day. O and of course a sweet tea to drink. I now understand why people would wait in the street to drive through. If you have a big order or drive through line is to far down the street, there is a side door that you can enter and walk in. As you can see, it is not a large place at all, but size of the restaurant does not matter when you deliver such a great product. On a photographic note, some of you might be wondering “How do you take a picture of a biscuit when there is no restaurant to sit inside?” Well I had to get creative. I can say that this is the first time I have ever had a photo shoot inside of my car. The white disc is the diffusion piece of a 5 in 1 reflector. It is creating a nice soft light for the biscuit. The gold reflector on the side is providing a little bit of fill. This is by far the most interesting set up I have had for a food shoot so far, so I just wanted to share it with you. Best biscuits in Chapel Hill hand down. And that’s saying a lot. I could have lived off of Sunrise biscuits alone during my time at UNC if my waistline would have allowed. I haven’t thought about SBK in awhile. Thanks for bringing back all those tasty memories! Oh man, and you’re going to have to go back! The bacon egg and cheese is no match for the fried chicken biscuit. They somehow manage to take an irregularly shaped, thick, juicy, beautiful chicken breast and pair it with the perfectly shaped homemade biscuit. It is the most delicious miracle I’ve ever witnessed. My son is a student at UNC. I sent him the link. Sounds great and your pics are terrific. I was lucky enough to live within spittin’ distance of Sunrise for 18 months or so a couple years back. I still miss it. This is my favorite breakfast in Chapel Hill!! Thanks for sharing your shoot setup. That was really interesting to another photographer! 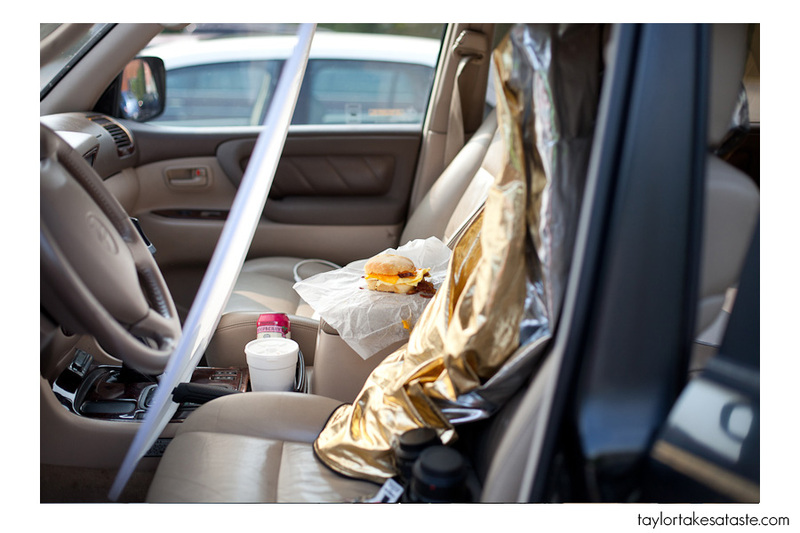 I’ve been known to open up the sun roof and use a piece of white poster board to shoot small things in the car. ha! Can’t wait to more regularly peruse your blog – I just stumbled upon you today. Thanks Catie! Glad you liked seeing the setup! I agree Sunrise has amazing breakfast!